Are you hungry to know God more, to walk in His ways, to dive deep into His Word? Are you ready to be a bold and purposeful disciple of Christ? Do you want to change your habits and the way you live on a day-to-day basis? Do you long to discover God's plan for your life? Developed from years of student ministry experience, the Intensive Discipleship Course is designed specifically for high-school and college students - individuals and groups - whose answer is yes to these questions. 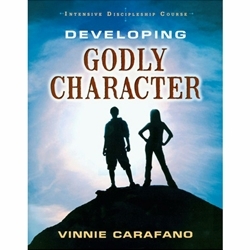 In Developing Godly Character, students will establish a firm foundation for effectively studying the Bible, developing a strong prayer life, serving in humility, overcoming sin, and growing spiritually. This is a twelve-week, life-changing exercise of commitment and learning.